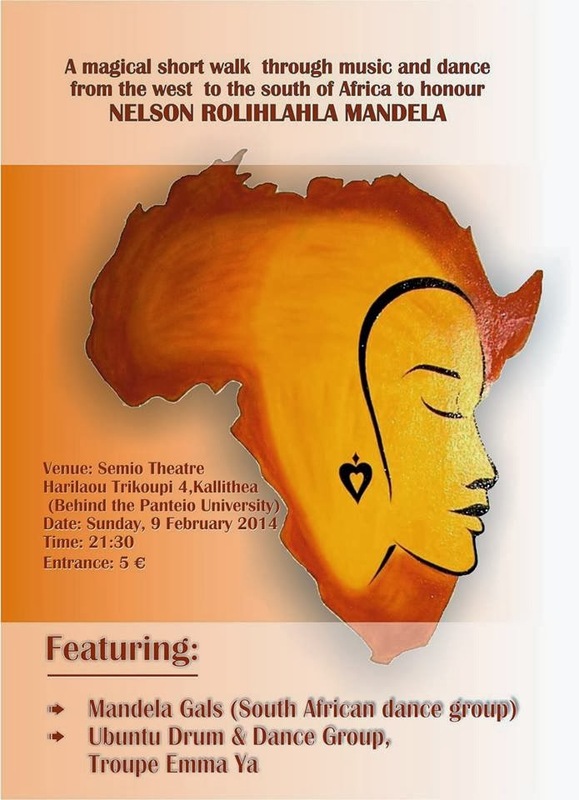 On Sunday the 9th of February at Semio Theatre in a suburb of Athens there is a short walk through Africa as a tribute to Nelson Mandela with performing groups like the Mandela Gals and Ubuntu Drum and Dance group. Music and dance play an important role within the African communities. To be precise, it is part and parcel of their everyday life. People sing, dance and play music at many events such as childbirth, coming of age, weddings, harvest and even death. A SHORT WALK THROUGH AFRICA is a show that will take you to Africa, from West to South, through music and dance. The performance starts with an opening speech about Nelson Mandela given by the South African Ambassador in Greece, H E Mr S. R. Makgetla. This will be followed by the Mandela Gals, from South Africa, and the Ubuntu Drum and Dance Group who will accompany you with the beat of the drum, dance and song on this magical journey. Troupe Emma Ya will also be participating in this show.